The Fortnite trend is not going anywhere anytime soon! My house is filled with sounds of people playing it and even at work I can’t escape it…which isn’t a bad thing at all. 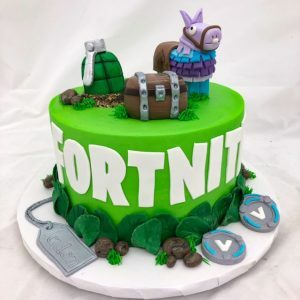 We love making Fortnite cakes and this week we made several. They were all different sizes and a bit different in design as well. The first cake was a single tier cake to serve 16, which was iced in lime green buttercream. 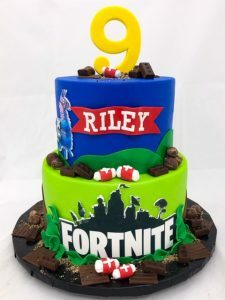 We then added fondant accents including dog tags, scenery and V-bucks. 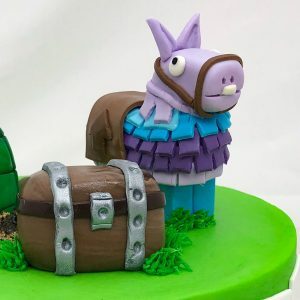 For the toppers, we added a grenade, treasure chest and llama, which were all hand-sculpted from fondant. The llama is especially fun to make with its layers of fringe in purple and blue. 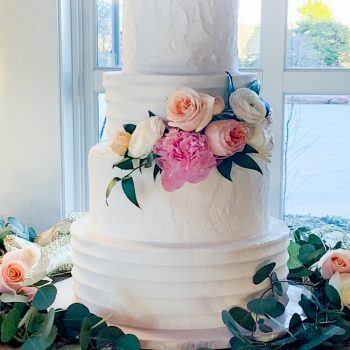 The second and third fondant cakes were two-tiers to serve 25-30. These cakes were both iced in buttercream, with the one for Cash having a camouflage effect on the bottom tier. 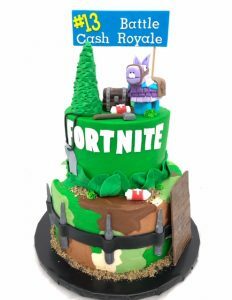 Both cakes had fondant accents – some were 2D and some were 3D like the med kits, llama, bullets, treasure chest and trees. 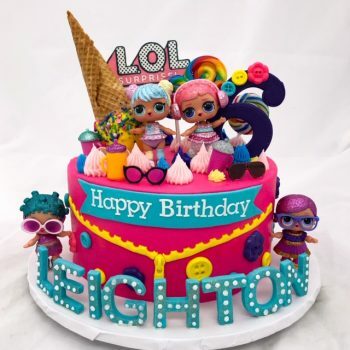 We had a great time creating these cakes…Happy Birthday Boys! !